Two new product videos by L-ACOUSTICS, "ARCS WIDE and ARCS FOCUS" and "CONSTANT CURVATURE LINE SOURCES", are now available online. In the Constant Curvature video, Scott Sugden, head of application, touring for the US, gives a short presentation on the physical principles and acoustic properties of L-ACOUSTICS WST constant curvature line sources and how they can be used in a variety of applications. 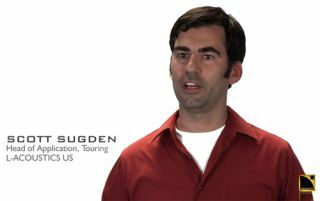 In the ARCS WIDE and ARCS FOCUS video, Sugden presents the ARCS WIDE and ARCS FOCUS constant curvature line sources. He reviews the main features of both enclosures and the associated SB18m subwoofer, as well as discusses system deployments, rigging options, amplification, DSP and software control.